Windows Task Manager is a task manager application integrated and built into Microsoft Windows operating systems. In Windows 9x, Windows Task Manager is called “Tasks”. The application provides information about computer performance and displays details about running applications, processes, network activity, logged-in users, and system services. In Windows Vista, Windows Task Manager is further enhanced with a new Services tab to view and modify currently running services, and a few new columns such as Description column to view the full name of a process. Another new column is Image Path Name that shows the path or location of the files that span the running processes in Windows Vista. Start Windows Task Manager by pressing Ctrl + Shift + Escape key sequence, or pressing Ctrl + Alt + Del and then choose Task Manager, or right clicking on your Taskbar and select Task Manager. Click on Processes tab if you’re still not viewing it. In Windows Task Manager window, click on View menu. Then click on Select Columns option. 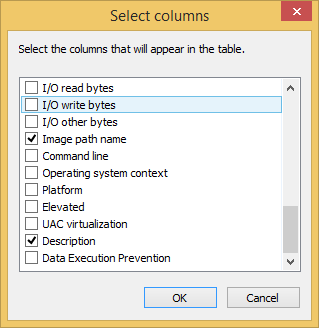 In the Select Columns pop-up dialog, select (tick) the Image Path Name checkbox. You can also select Command Line to view the complete command used to run the processes or apps. Start Windows Task Manager by pressing Ctrl + Shift + Escape key sequence, or pressing Ctrl + Alt + Del and then choose Task Manager, or right clicking on your Taskbar and select Task Manager, or open Win-X menu and select Task Manager. Right click on the row of column header, then select Select columns option. In the Select Columns pop-up dialog, select (tick) the Image Path Name checkbox. You can also select Command Line (also available in Processes tab) to view the complete command used to run the processes or apps. You will be able to see the full path or the location of the files with filename that are called to start the list of processes in Windows Vista. Some may not have value or entry as they’re system processes.